Step 1 Preheat the oven to 400ºF. In a 5-quart Dutch oven over moderately high heat, melt the butter. Add onions and sugar and saute over high heat until onions are lightly golden - about 10 minutes. Reduce the heat to moderately low and saute 10 more minutes, stirring occasionally. Step 2 Add stock and water and bring to a boil over high heat. Reduce the heat to moderately low and simmer, uncovered, for 20 minutes. Add brandy (optional), salt, and pepper and return to a boil over high heat. Step 3 Ladle soup into four 8-ounce oven-proof ramekins or soup bowls and place on a heavy-duty baking sheet or ovenproof metal tray. Top each portion with toasted French bread and sprinkle with 1 tablespoon cheese. Step 4 Bake, uncovered, until grated cheese is melted - about 5 minutes. 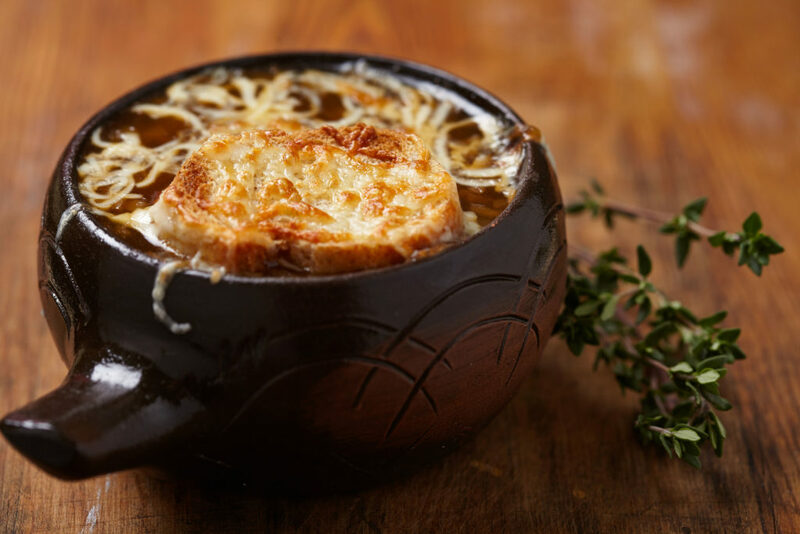 This traditional take on the classic French Onion Soup is the perfect way to end a cold autumn day.